D4D - "Boy, it sure would be nice if we had some grenades, don't you think?" Boy, it sure would be nice if we had some grenades, don't you think? 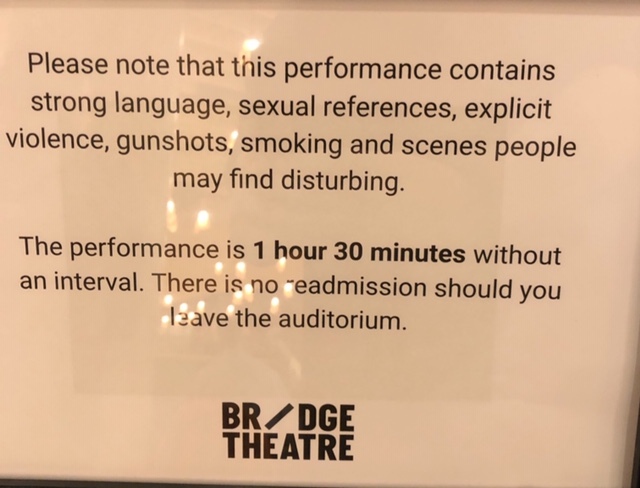 This weekend, I saw my final performance of the year – I know there’s only three weeks to go, but still, I’m pretty sure I was seeing stuff ’til later in the year last time round. This weekend I was at the BBC Radio Theatre (as a plus-one for the friend who’d managed to get the tickets) to see Neil Gaiman recording a programme that will go out on BBC Radio 4 on Christmas Day. As it turned out, he’d also brought along some friends, including Mitch Benn, Peter Capaldi, and some refugees (his words, not mine) from the Ukulele Orchestra of Great Britain. It was a good evening and lot of fun to see. It’ll also be interesting to see what makes the actual broadcast. The previous weekend, I’d been to see Tamburlaine at the RSC in Stratford for the matinee performance on its final day. I did enjoy it, although some casting choices were a bit odd to me, particularly in the second half, where the same actress is doing two roles – one as the wife of Tamburlaine, and one as the heir of the dead king, aiming to overthrow Tamburlaine. It’s a credit to her that it was impossible to confuse the two roles as she played them, but it still made things rather more complex and odd than they needed to be. I’ve already got several theatre visits lined up for next year, but just for now it’s on pause. Which is fine by me. In an ongoing thread, there are times where I realise I really am a silly sod. This is another of those things. A fair while back, the Cowboy Junkies (one of my all-time favourite bands) announced they were coming to the UK. It had been a fair while since they’d been here last, and even better, it was happening the weekend after my birthday. However, that was also the end of the week I was already booked up to spend in Northumberland, which was a Friday to Friday booking. And they were playing Manchester on the Saturday, and London on the Sunday. So I figured what the hell, it’ll be a weekend, and booked tickets for both Manchester and London. Well I was up in the area anyway, and the London one was billed as being different to the Manchester one (although that has since changed). So why not? (Other than mileage, of course) I’d drive over from Northumberland to Manchester on the Friday, stay in a hotel overnight, do the gig on the Saturday night, and then drive home afterwards. Easy. And then the plan changed a bit. When I saw the play Queen Margaret in Manchester, I realised how painless the journey was by train. So instead I figured I could drive home from Northumberland on the Friday – allowing me to get laundry and so on done in the evening and so on. Then on the Saturday I could get the train up, have lunch somewhere new and fancy that had grabbed my attention, then walk down to the hotel, check-in, drop off bag etc., go to the gig, stay overnight on Saturday, train home on Sunday morning, then down to London for Sunday night. The weekend just past is the one where I was supposed to be doing that walked Night Marathon in London. I failed to complete it last year (as I’ve written about elsewhere) and this year didn’t start it – primarily because I just hadn’t been able to get in the practice and preparation that would’ve made it easily doable, so I’d made the decision to not take it on at the last minute. So it should’ve been this weekend that I did it, and as it turns out, I’m actually quite glad I made that decision. First and foremost, the weather was vile, and doing it while being cold and wet really doesn’t appeal. All told, I’m still (mostly) happy with the choice to not do the walk this year. I’m annoyed with myself for having let the time slip past, and for not doing the training and preparation I could have done. But there we go, I didn’t do them, and while I probably could have just rocked up and completed it, I wanted to be better prepared this time. I’m signed up to do next year’s one though, so we’ll see how we go from here to there. And if I don’t do that one either, then I’ll most likely sack off trying again. Last week, Claude Bosi (one of the chefs I follow on Twitter) announced that one of his good friends, Bo Bech of Copenhagen’s Geist would be cooking at Bosi’s restaurant at Bibendum in Michelin House in London for one night only, in support of Bech’s new book, published that day. And I was lucky/early enough to get myself a table. The event was last night, and it was epic. Me being me, I turned up a bit early – I’m always happy to sit at the bar or whatever – which meant I also got to go into the kitchen, meet Chef Bech and his crew, and have a quick chat. Pretty impressive in and of itself! As part of the price of the meal, all diners also got a signed copy of the new book “In My Blood” (which is beautiful, and brilliant) which added to the event as well. 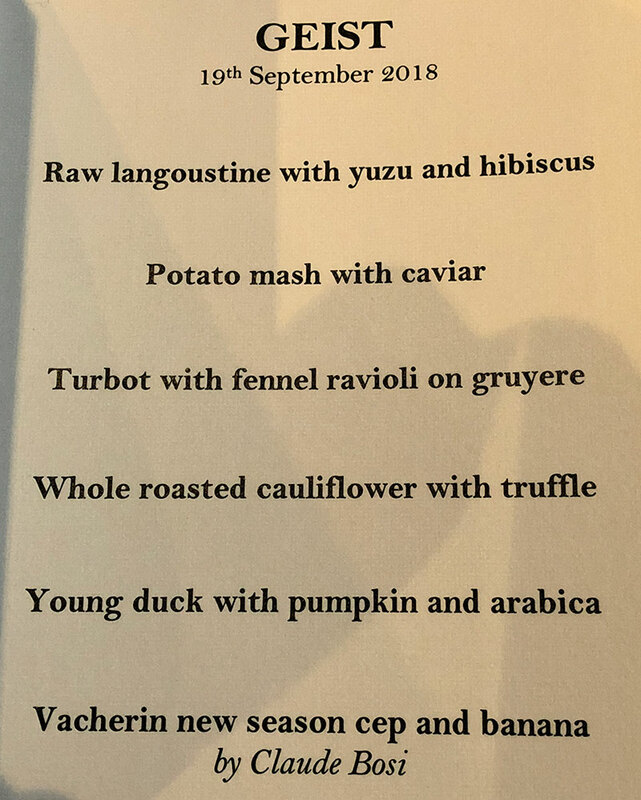 All told, it was one of the best meals I’ve had – and that potato mash with caviar is definitely the most decadent course! – and it was just spectacular.